Both parts of Steven Soderbergh's critically acclaimed film will hit Blu-ray in January. 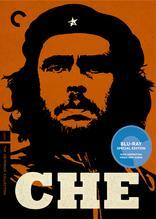 The Criterion Collection has announced 'Che' starring Benicio Del Toro is coming to Blu-ray on January 19. The 2-disc Blu-ray release will feature 1080p video, a Spanish DTS-HD Master Audio 5.1 soundtrack (with English subtitles), and supplements will include: audio commentaries on both films, featuring Jon Lee Anderson, author of Che Guevara: A Revolutionary Life; Making “Che,” a new documentary about the film's production, featuring interviews with Soderbergh, producer Laura Bickford, actor-producer Benicio del Toro, and writers Peter Buchman and Ben van der Veen; new interviews with Cuban historians as well as participants in the 1958 Cuban Revolution and Che's 1967 Bolivian campaign; deleted scenes; theatrical trailers; and a booklet featuring an essay by critic Amy Taubin. Suggested list price for the Blu-ray has ben set at $49.95. You can find the latest specs for 'Che' linked from our Blu-ray Release Schedule, where it's indexed under January 19.